2 Open Letter to Democracy NOW! REFUSE FASCISM is a project of the Revolutionary Communist Party initiated to remove President Donald Trump from office. 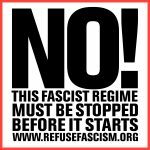 REFUSE FASCISM accepts tax-exempt donations through the Alliance for Global Justice. Open Letter to Democracy NOW! In October 2017, members of REFUSE FASCISM wrote an open letter to Democracy Now!, asking for coverage. A speech delivered on August 5, 2017 at the "REFUSE FASCISM National Meeting" by Andy Zee of REFUSE FASCISM kicked off a debate on whether or not Antifa/communists and their allies were promoting a civil war. The speech was titled "NO! This Nightmare Must End: The Trump/Pence Regime Must Go! In the Name of Humanity, We REFUSE to Accept a Fascist America!" "THIS NIGHTMARE MUST END. Millions feel this and ache with the question of how to stop this unrelenting horror. The stakes are nothing less than the future of humanity and the planet itself. "Who will end this nightmare? We will. Only the determined struggle of millions of people acting together with courage and conviction can drive this regime from power. "We will gather in the streets and public squares of cities and towns across this country, at first many thousands declaring that this whole regime is illegitimate and that we will not stop until our single demand is met: This Nightmare Must End: the Trump/Pence Regime Must Go! "Our protest must grow day after day and night after night—thousands becoming hundreds of thousands, and then millions—determined to act to put a stop to the grave danger that the Trump/Pence Regime poses to the world by demanding that this whole regime be removed from power." Numerous outlets downplayed the threat. Newsweek described the November 4th protests as a "Right Wing Conspiracy," and SNOPES wrote that there is "...no proof that any anti-fascist groups are planning even a skirmish." "Donald Trump, the President-elect, is assembling a regime of grave danger. Millions of people in the US and around the world are filled with deep anxiety, fear, and disgust. Our anguish is right and just. Our anger must now become massive resistance –before Donald Trump is inaugurated and has the full reins of power in his hands. Right now: wave of publishing the Call to Action as a sign-on ad in major newspapers. Initial funds needed as signatories are garnered. Sat – Mon Jan 14-16: Martin Luther King Weekend actions around which highlight & raise determined opposition to the white supremacist, American chauvinist, religiously bigoted character of this fascist movement and regime which draw forward everything thus far built and build further. People begin coming to DC. Tues-Thurs Jan 17-18-19: fill the streets of DC with millions, millions more demonstrate in every major city and small town all over US and the world, demanding that Trump-Pence be prevented from taking office before January 20. A REFUSE FASCISM petition "RefuseFascism.org Calls for Mass Defiance of Fascist Trolls" "Calls for Mass Defiance of Fascist Trolls In the Name of Humanity – We REFUSE to Accept a Fascist America!" This page was last modified on 10 December 2018, at 13:42.